Microsoft today announced it has simplified how Microsoft accounts are managed by its users, including on Outlook.com. The change is rolling out now and will be available on all accounts in the next few days. To manage your aliases (or make other changes to your account), all you have to do is head to account.live.com, click on “Account aliases” in the left navigation bar, and then follow the instructions. Microsoft says this is a “simpler and clearer” interface for adding, removing, and setting any of your aliases as the primary one. 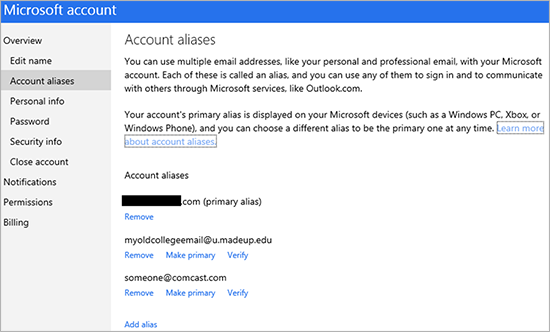 The company also explains that since you can sign in with any alias, the main reason for setting a different alias as the primary one is to have a different email name show on your Microsoft devices. As such, since Microsoft account users have more flexibility now (you can sign in with one alias but use another to send mail or display on your Xbox), the Rename feature is a little bit dated. As you can see above, its replacement is much more straightforward. The new account alias section is worth checking out. If you want to add a new alias, Microsoft lets you create a completely new email address (with an Outlook, Hotmail, or Live domain name) or add an existing one.